“The catalyst was basically, I’ve got these pieces that I would love to try out, but nowhere to do it, let’s work together.” That, according to playwright Mhairi Quinn, was the spark that led to the creation of Tandem Writing Collective, who create bold and eclectic short plays and are about to make their first appearance at the Tron Theatre in Glasgow later this month. 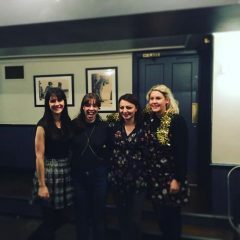 The collective, which she formed in 2016 with fellow playwrights Jennifer Adam and Amy Hawes, writes and stages new work at Edinburgh’s The Canons' Gait pub and DRAM! in Glasgow, and was set up to perform short “taster pieces” of theatre written by the three playwrights. This theatrical night of treat-size new writing came about from a sense of frustration; as emerging playwrights, Quinn, Amy Hawes and Jennifer Adam wanted to get their work on stage and seen by people in the industry. So, they did what other emerging playwrights in Scotland would do – write plays and apply for funding, prizes and schemes. However, because everyone else was doing it, getting noticed was difficult. Tandem is designed to be a welcoming and informal evening, where the audience can head to the pub to watch a night of new writing for no charge. Because there is no funding in the collective, everyone involved in the evening does it for no fee, and as they aren’t taking money at the door, the pubs they work with allow them to rent the space for free. The preparation for this showcase always takes place over one day where they workshop the script with the director, and the collective have very few rehearsals so that everyone can be involved in their spare time. This 'by the seat of your pants' approach has won them support, not just from audiences but also from actors such as Stephen Greenhorn. Crucially, it gave them the confidence to, as Quinn puts it, “chance their arm” by approaching Andy Arnold at The Tron about staging an event at the venue. He agreed, giving them one evening in February, before having to add an extra date after the first one sold out. Six plays in sixty minutes, anyone? 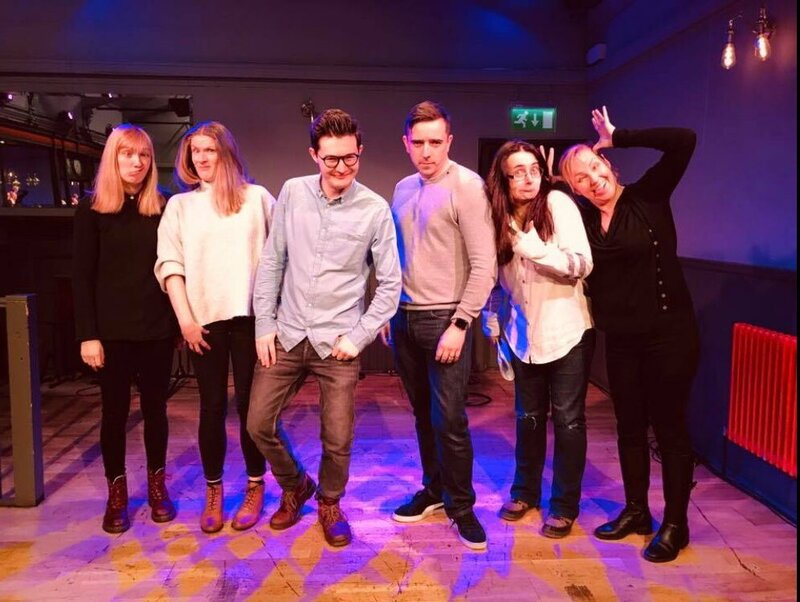 The novel idea sees three emerging playwrights showcase their work in 10-minute vignettes in the basement of Edinburgh’s Canon’s Gait bar – the fourth event of its kind put on by the Tandem Writing Collective – which proves to be a compact, convivial backdrop for the evening. Though the concept might sound a little breathless, it plays out like a relaxed taster menu of intriguing theatre, perhaps aided by the 20-minute interval and the traditional Scottish music from Boorach which fills it, and certainly by the talented writing of the girls in question. First up is Stuck, a study in “appropriate” responses to heightened tensions, as a hitchhiker and her driver become involved in a car crash and learn more about each other than they’d bargained for. The mundanity of this anthropological analysis is juxtaposed jarringly with Preparing for the Afterlife, a snapshot of two women hiding away from the world for reasons unknown. The undercurrent of menace is dominant throughout, punctuated only now and again by soundbites of funny dialogue which work to puncture but not completely deflate the eerie tension. Closing the first part is The Thing About Cats, a short monologue that serves almost as an inverse to the play which preceded it; while the work is funny more than anything else, it reveals a sinister underbelly at its climax. Perks of the Job picks up the comic theme where it left off before the break, channelling classic Scottish works like The Steamie as it charts the progress of two cleaning ladies who break into the Balmoral Hotel swimming pool to enjoy an illicit dip. Partridge is a more sombre affair, exploring the universal subtleties and mixed emotions of a faltering relationship in its final stages. Meanwhile, closing play At Home with Bella is the silliest, most caricatured piece of the evening which parodies the self-importance of celebrity chefs (and TV darlings in general). Each of the writers present two different works, one of which is markedly more humorous than the other. While the range of topics and styles demonstrate their versatility, the most effective scenes are the ones in which comedy is brought to the fore – most notably, in the two which bookend the interval. This may also be in part thanks to the standout performance of Debbie Whyte, whose bolshie brazenness in both of the roles recalls something of the quirk of Green Wing’s Sue White (albeit with the nuttiness dialled significantly down). While Whyte produces the most memorable performances, Debbie Cannon provides ample support (especially as the wet cloth to Whyte’s livewire in Perks of the Job) and Alannah Beaton and Philip Kingscott show perhaps the greatest depth of the night with their intimately painful breakup in Partridge. The final play sees all of the cast gather for some good, old-fashioned fun-poking at the not-as-rich-and-famous-as-they’d-like-to-be, with Cameron McGarva’s grinning smugness a particular highlight. Indeed, all of the actors acquit themselves admirably – all the more impressive since they only had an hour to rehearse on the day of the performance (though it’s unclear why this self-imposed stinginess with rehearsal time came about) – and Kolbrún Björt Sigfúsdóttir’s direction ties everything neatly together. Though each of the plays work well as a standalone, short snippet of theatre, it’s difficult to see how any of them could be fleshed out into a longer work (with perhaps the possible exception of Preparing for the Afterlife, if only for the curiosity it engenders). However, as a vehicle for developing their playwriting abilities, the night is certainly a successful one – not to mention a thoroughly entertaining diversion for all of the audience. Here’s looking forward to the Tandem’s next venture!